Columbia University Press, 9780231146579, 287pp. Natsume Soseki (1867-1916) was the foremost Japanese novelist of the Meiji Era, known for his books Kokoro, Botchan, and I Am a Cat. Michael Bourdaghs is associate professor of modern Japanese literature at the University of Chicago. 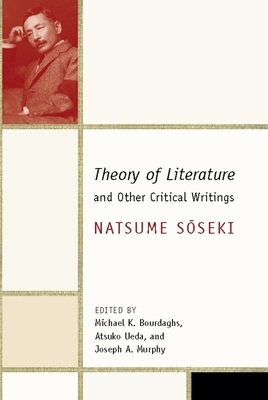 He is the author of The Dawn That Never Comes: Shimazaki Toson and Japanese Nationalism and the translation editor of Kamei Hideo's Transformations of Sensibility: The Phenomenology of Meiji Literature. Atsuko Ueda is assistant professor of East Asian studies at Princeton University and the author, most recently, of Concealment of Politics, Politics of Concealment. Joseph A. Murphy is associate professor of languages, literatures, and cultures at the University of Florida and author of The Metaphorical Circuit: Negotiating the Gap Between Literature and Science in Twentieth-Century Japan. His recent work concerns the cognitive basis of narrative comprehension and includes an article in the volume Cognition and Literature, forthcoming from Yale University Press.